Claudia B. Rebola, graduate studies coordinator in UC's College of Design, Architecture, Art, and Planning (DAAP), designed a device to make naloxone more accessible to those in need. Her intent is to bring a model she helped create first in Providence, Rhode Island, to spaces in Cincinnati by spring. An associate professor in DAAP's Myron E. Ullman, Jr. School of Design, Rebola has worked with graduate students to create AntiOD, a naloxone-dispensing smart device installed in semi-public places with step-by-step instructions for bystanders. Looking at a broader view of educating the public, Rebola's team has also created an informational campaign to train the public on signs of overdose and how to help. The research is just one prime example of the university's commitment to urban impact, one of the pillars of UC's strategic direction, Next Lives Here. For Rebola, combating this crisis isn't just a concern for emergency responders, people who use opioids or their family and friends—it's something that affects everyone. "Our 911 is oversaturated to the point where it's becoming the new normal," Rebola says, "so I find value in this project. We are trying to empower bystanders to take a role in this crisis by educating them, by empowering them: Be a good citizen. We can do this together for a healthier Cincinnati." "Whoever overdoses could be next to us, and we don't recognize it and we don't do anything about it," she says. "It's ubiquitous. It goes across gender and class—it could really be anyone. I find it surprising that people are not taking ownership of this problem. So I'm fascinated that with this, to my eyes, simple design intervention, we are taking ownership." After receiving a grant from UC's Communication in the Urban Environment initiative, she and her team of graduate students researched how to improve on the NaloxBox—now AntiOD—from design and awareness to training and efficacy. "One of the methodologies that we have in research through design is that we can deploy something, learn from it, then redesign it," Rebola says. From a visual standpoint, AntiOD is a much more design-driven project with eye-catching graphics and messaging, accessible packaging and smart functional product design. And in order to make it a more user-centered product, the team worked with focus groups to better understand how people react in stressful emergency situations. They learned that some in the group—particularly international students—weren't even aware of how bad the crisis is, particularly in Hamilton County. 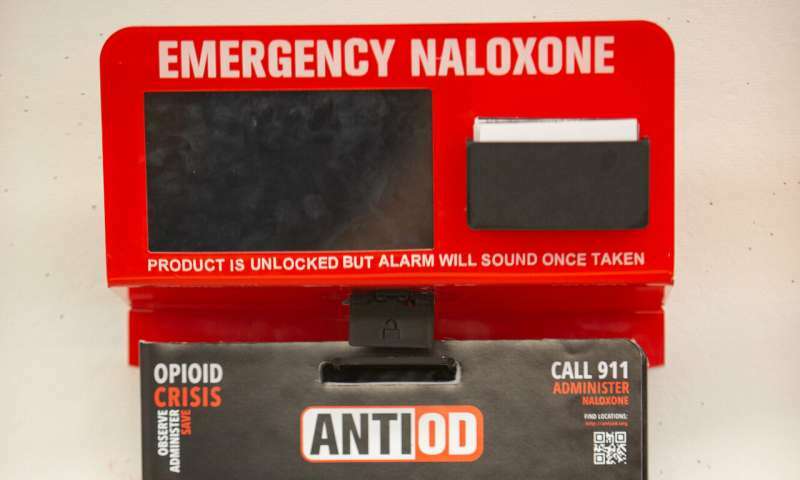 Creating an educational campaign around AntiOD, informing the public on signs of overdose, where to access naloxone and how to administer it, soon became just as crucial as redesigning the dispenser. "We are trying to make AntiOD a three-step process where we are designing access, giving knowledge and creating the empowerment of how to go about it," says Swati Chopra, second-year master of design degree student and graphic designer, who works alongside team members Norberto Sanchez and Sebastian Ramirez. AntiOD and its campaign are set to debut this spring. Rebola is working with Downtown Cincinnati Inc. (DCI), a nonprofit dedicated to building a dynamic city center, to locate strategically the dispensing units in areas of high risk, like the public libraries and convenience stores. DCI trains ambassadors stationed around downtown to help make the city safe, clean and accessible to residents and visitors—they may soon carry AntiOD on patrols. 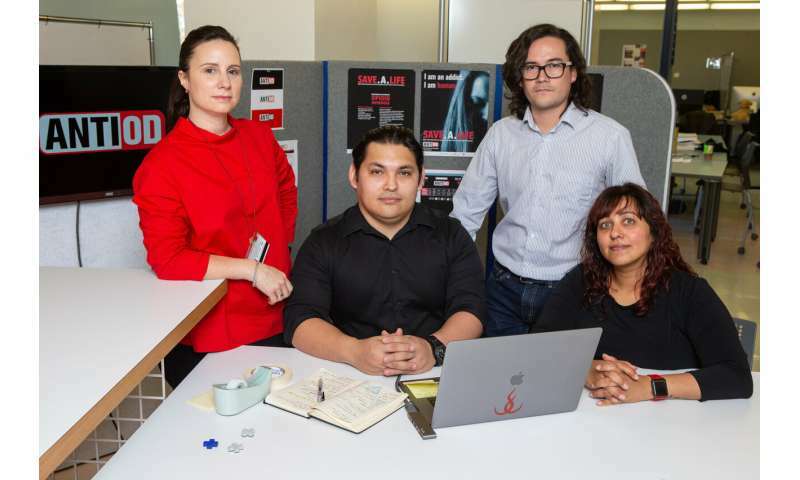 Rebola is also working with Cincinnati Bell to make AntiOD training and messaging available via text and has entered the design in Fast Company's 2019 World Changing Ideas competition. Rebola likens AntiOD to fire extinguishers and defibrillators—emergency response tools that are made readily accessible to the public. "Many projects that we do through our program, they may end in the classroom or as a research paper," she says. "With AntiOD, we're not just designing something, we're designing it for a good cause—something that is going to be implemented, something we can see, measure and have an impact on our city."